It was a chilly day, and Cleo the standard poodle arrived for her appointment looking chic in a plaid quilted coat. I asked her owner if Cleo would be cold without the coat, and she admitted that she didn’t know. “But she loves her coat, because she knows that when I put it on her we’re going somewhere,” she added. Sweaters and coats for dogs are often objects of ridicule, but during our cold winters, some dogs benefit from being dressed for the weather. A dog’s coat is provides insulation and helps prevent the loss of body heat into the cold air. I’ve seen Chesapeake Bay retrievers jump into frigid water to retrieve a stick, then return to shore and beg the owner throw it again. Labrador retrievers break through thin ice to swim after fallen game. And one of our clients has Tibetan mastiffs that prefer sleeping outdoors, ensconced in the snow, to being in a warm house. But not all dogs have a thick, warm coat that keep them from shivering in our wintry climate. It’s not surprising that small dogs need extra insulation. Chihuahuas, miniature pinschers, and rat terriers, for example, simply aren’t equipped to deal with our winters. Even big dogs with short hair (especially if they are lean), such as greyhounds and Dobermans, tend to prefer being covered on their walks. So how do you determine if your canine needs couture? By observation. During their dog’s first winter, most people figure out just how much cold they can abide. A cocker spaniel that can comfortably go on a 10-minute walk when it’s 25 degrees outside might begin to shiver after 15 minutes. The same dog in the same weather playing fetch will be uncomfortably warm with a coat or sweater on. Acclimation plays a role, too. The aforementioned cocker might, by the end of winter, be able to tolerate a much longer walk in the same weather with nary a garment. Besides coat quality, age and health make a difference. Puppies, sick dogs and frail old dogs need to be kept warm. 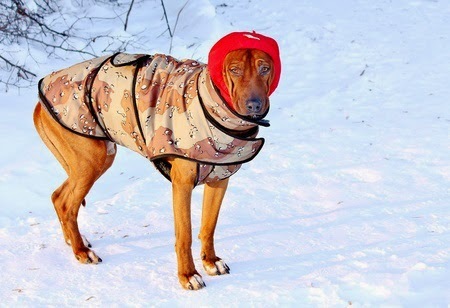 And most dogs can use a coat if it’s chilly and wet, or brutally cold and windy: Even northern breeds participating in the Iditarod have special jackets for that type of weather. The same criteria apply to the need for dog booties: Observation is the key. You’ll know your pooch needs footwear if he limps from the cold on his walks, or does a dance, hopping uncomfortably from paw to paw. Many of our clients tell me their dogs need booties when the thermometer dips below 20 or 25 degrees. Dogs with hairy paws can collect ice balls between their toes, which can be painful and impair mobility, a problem also solved by booties. With so many pet products on the market – Americans spent $13.72 billion on them (excluding food) in 2014 – you’re sure to find Fido the perfect garment to keep him or her cozy. Because many dogs have little or no hair on their bellies, I recommend buying a coat or sweater that covers that sensitive area, with an accommodation to allow male dogs to relieve themselves. As for booties: Unfortunately, it’s a challenge to find ones that dogs accept, or that don’t fall off. My client’s old dog Cleo might not have actually needed her coat, but she didn’t mind it; and because her health is somewhat fragile, it sure didn’t hurt her. But be careful not to dress dogs that don’t need it. Being overheated, especially during aerobic activity, is uncomfortable or even dangerous. And using unnecessary sweaters or coats as a form of self-expression isn’t a great idea. That Roberto Cavalli puffer jacket may be a status symbol, but if your pug finds it repugnant, you’re not doing the poor guy any favors. A simple, practical coat – or none at all – might be sufficient. 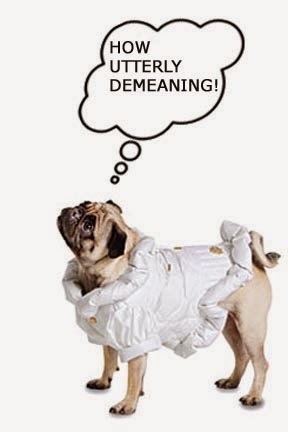 In Hamlet, Polonius says “the apparel oft proclaims the man”; but clothes don’t make the dog. When I write blog posts, I often feel that I admonish pet owners too much: Don’t use rodent poison! Keep house plants away from pets! Watch out for raisins and grapes! Well, folks, that’s my job, so here’s an addition to that list of concerns: laundry and dishwashing detergent pods. We’re always looking for products that save us time and effort. Hence the invention of the laundry detergent pod, which has become popular in the past couple of years. I admit it’s a useful innovation: Just reach into a container and plop a pre-measured packet of detergent into the dishwasher or washing machine. No mess, no measuring. Unfortunately, detergent companies have made the pods enticing to both kids and pets. Small children think the colorful ones are candy. And dogs? Well, anything left within reach is fair game to play with or feast on, and these pods are just the right size for munching. Between March 2012 and April 2013 17,230 children under the age of six were accidentally poisoned by the packets (Pediatrics, December 2014). Only 4.4% of the children were hospitalized, but of those, 56 had a “moderate or major medical outcome.” Some victims stopped breathing and required ventilation support; one child died. Dogs that eat old-fashioned laundry detergent powder react to the unpleasant taste; they drool and might also have a mild GI upset, such as vomiting and diarrhea, that will resolve itself over time. But the reaction to biting into a detergent pod is more severe. The product in the pod not only is highly concentrated but also explodes under pressure from the bite. The detergent is forcefully expelled, and large amounts may be aspirated or swallowed. Eating the pods, which are encased in plastic, may also pose a foreign body obstruction risk. The symptoms in dogs are similar to those in children: vomiting (84%); coughing (21%); lethargy (17%); and gasping, wheezing, and other respiratory difficulties (13%). The Pet Poison Helpline reports that 72% of pets exposed to the pods develop clinical signs. If your furry friend gets into mischief and decides to chomp on a detergent pod, water is your friend; liberally rinse your pet’s mouth, skin, and eyes until the slippery, soapy feel is gone. Any symptoms that persist, such as vomiting or respiratory abnormalities, warrant a trip to our office or a call to an emergency clinic. There’s no antidote, but we can provide symptomatic and supportive care. Don’t forget to bring the detergent container with you. Making these products less colorful is a step in the right direction for preventing ingestion by kids but won’t help our curious canines. Companies should explore measures that help not only children, but also pets, such as coating the pods with a foul-tasting substance. I researched homemade laundry detergent as well as plant-based “natural” laundry detergents, hoping that they would be safe if ingested. No such luck! The safety information sheets for many of these products indicate that they can be severe irritants if inhaled or ingested. So keep your fancy pod products (and all other cleaning products) safely out of reach of your furry companions. Better yet, don’t buy the pods if you have small children or inquisitive pets. It’s just not worth saving ten seconds of your time. A Dec. 31 blog post on The BMJ (formerly The British Medical Journal) Web site by a former editor of that journal has the medical community abuzz. Richard Smith, M.D., concludes that “death from cancer is the best.” He admits that his view of dying of cancer is romantic: "You can say goodbye, reflect on your life, leave last messages, perhaps visit special places for a last time, listen to favorite pieces of music, read loved poems, and prepare, according to your beliefs, to meet your maker or enjoy eternal oblivion. "This is ... achievable with love, morphine, and whisky," Dr. Smith writes. Further, he warns to stay away from “overambitious oncologists” to avoid overtreatment. Many physicians were aghast at his suggestions, and I can understand some of their criticisms. Many of us have known someone with cancer who suffered greatly, sometimes for many months, despite the best efforts of hospice (including lots of morphine!). But there’s a lot of truth in his observations about the way we humans have to die. I thought about Dr. Smith’s article in the context of pets. My observations of companion animals over the past 38 years lead me to conclude that there is no “best” way for them to die. Some pets with organ failure fall asleep and never wake up, dying a peaceful death, while some are clearly uncomfortable or in severe pain. Ditto for cancer patients. Our clients with sick pets are given choices for treatment, including no treatment. Most of them are loath to put their very ill pets “in and out of hospitals and too much in the hands of doctors.” They are relieved that when we can no longer alleviate their pet’s suffering, we have the advantage of performing euthanasia. I don’t necessarily advocate euthanasia for humans, but I think our pets are lucky not to have to experience a “most horrible medical death,” as many humans do. 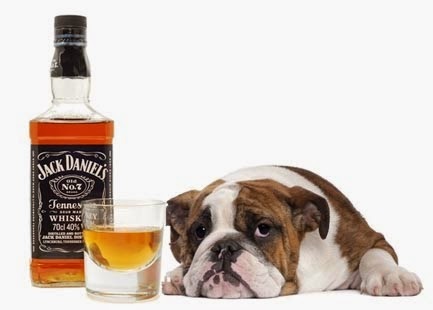 We don’t achieve this with morphine and whiskey, but with a strong sedative and pentobarbital. And love. 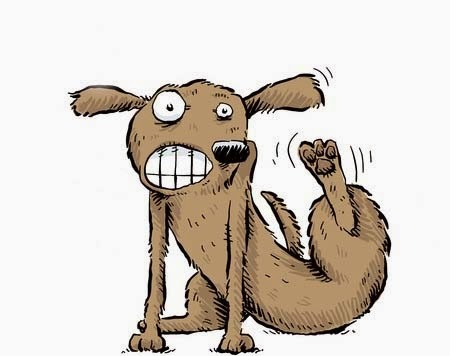 I’ve written a lot about itchiness in dogs, because it’s a prevalent problem. If you’ve read my blog posts, you know that allergies and fleas are the most likely culprits that cause scratching. But what about the dog with no allergies that has an uncomfortable winter itch? For the healthy, non-allergic dog living in our arid Midwest winter environment, dry skin is the predominant cause of scratching, chewing, and rubbing. The top layer of the epidermis (the outermost layer of skin) is composed of a compact layer of dead skin cells called keratinocytes. The keratinocytes are continually sloughing and being replaced by cells from lower levels. So it’s normal to see some flakes of skin, especially on dogs with dark coats, where the contrast between flakes and fur is obvious. I can’t always judge the severity of dry skin by appearance, but the client’s history usually tells the tale. We’ve all experienced the itching, stinging, and general discomfort of dry skin; I always have a cheap bamboo back scratcher within easy reach in my bedroom. But our furry friends don’t have opposable thumbs to alleviate this vexation, so it’s up to us to help them. Humidifiers are the most effective remedy for dry skin, but many dogs are itchy in spite of them. We then tackle the problem with oral supplements and/or topical treatments. It’s best to avoid shampooing your dog during the dry winter months, but that’s not always practical. If washing is a must, a hydrating shampoo (with an associated cream rinse), such as Micro Pearls Advantage Hydra-Pearls Rehydrating Shampoo, Allergroom shampoo, or Hyliderm Shampoo +PS, will preserve the fatty (lipid) skin barrier and have a soothing, emollient effect. Topical sprays such as Micro Pearls Advantage Dermal-Soothe are great for short-haired breeds. Look for products containing ingredients such as ceramides and phytosphingosine, which help restore the fatty skin barrier. All of these products are available without a prescription in pet stores or on the internet. The cornerstone of dry-skin therapy is fish oil. The active elements of fish oil are polyunsaturated omega 3 fatty acids called EFA and EPA. The fish don’t produce those fatty acids; they obtain them from their diet of algae. If you are environmentally conscious, you can buy an omega 3 algae oil supplement, which is free of the toxins often found in fish oil and doesn’t contribute to the depletion of marine life. Although you can use fish oil products made for people, there are advantages to using ones intended specifically for pets. They come in convenient forms, such as pump bottles and chewable tablets, and some have enticing flavors added. Prescription diets (Iams Response FP, Hills j/d) or over-the-counter sensitive-skin diets also can be an easy way to give dogs a daily dose of fish oil. There are potential adverse effects of fish oil; more is not always better. But at recommended doses (read the label!) they seem to be safe, and they do help many of our patients with dry, itchy skin. When I started practicing veterinary medicine (before the crust of the Earth cooled), it was popular to add corn oil to dogs’ food to help with shedding and dry skin. The dogs that benefited probably were on diets that were too low in fat (such as weight-loss diets). The same might be true of flaxseed and its oil. The fatty acid in flax is ALA, a precursor to EFA and EPA. Barely any ALA is converted to those more-active forms, yet some of my clients swear that flaxseed makes their dog’s coat shiny and helps with dry skin. Perhaps the extra fat or other unknown nutrients contribute to its success. There are hundreds of pet products for itchy, dry skin. Choose one or two that are easy for you to administer and acceptable for your canine companion, and give ‘em a try. Ogden Nash quips that “happiness is having a scratch for every itch.” But maybe happiness is having no itches to scratch!